SUPREME best describes the newest addition to the Playground One lineup! This Supreme Playcenter Combo 4 has it all and then some at a price that even the most discriminating play set shopper will appreciate. 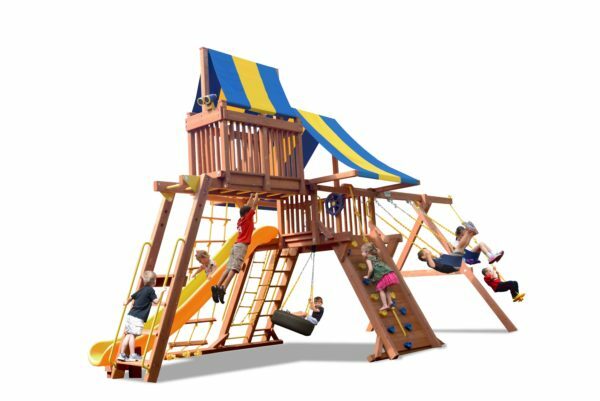 Showcasing 4″ x 6″ heavy duty construction, a 6.5′ high play deck with a 13′ super slide, Monkey Bars, Sky Loft, and a 9.5′ high swing beam this unit will challenge the most active youngsters throughout their childhood. Dare to compare and find out once again why Playground One will let your imagination FLY!